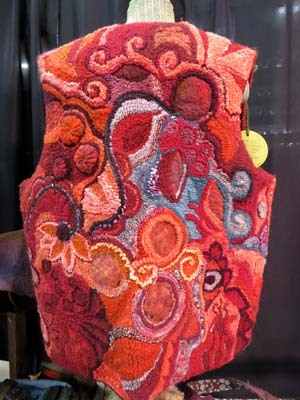 This wool vest made by Una Walker was on display at Estes Park Wool Market last month. From raw, recently shorn wool to wearable wool art, I saw all the products that anyone who loves fiber might want at this year’s Estes Park Wool Market. 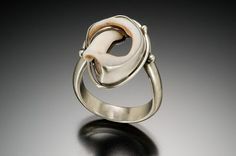 While I was searching for Front Range artisans to feature on this blog, I met several who had come from farther away. What they taught me on the spot was fascinating – so much so that I pulled out my notebook and camera and tucked away my Front Range criteria. First was Una Walker, California owner of Wooly Walkers, who made the vest pictured here. 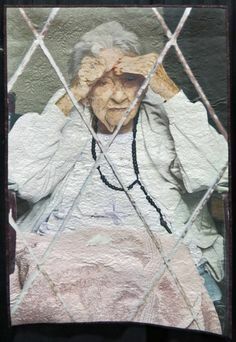 Punch needle rug hooking is Una’s business – she sells supplies, designs patterns, teaches workshops, and creates handbags, cushions, and anything else suitable to the heft and durability of a hooked rug weight. Una Walker demonstrated punch needle rug hooking at the Estes Park Wool Market. Watching Una at her craft, it occurred to me that rug hooking is somewhat of a misnomer for her technique. 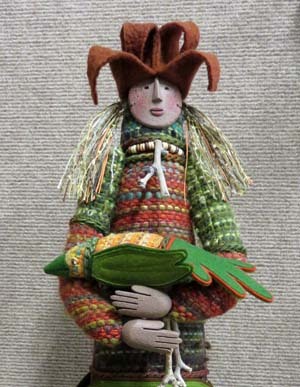 Traditionally, rug hooking requires the use of a hook to pull up loops of wool or other material through woven fabric. Instead of pulling wool up, Una was pushing wool down with her punch needle, just far enough to leave small loops on the other side. I had to admit, though, that the loops looked just as they would if she had used a hook. Wool isn’t the only material that Una uses with her punch needle. Some of her finished work at the Wool Market included ribbon and torn strips of cotton fabric intermixed with wool. To give even more textural interest to handbags and to the vest pictured above, she had sewn circles of felted wool fibers onto the fabric backing before filling in the remaining area with needle punch rug hooking. “There are no rules,” Una told me with a laugh. Mythical figures with clothing or skin of colorful wool filled Alice Watterson’s booth at the Estes Park Wool Market. Next I met Alice Watterson of New Mexico, whose booth was filled with figures made from wool cloth she had woven and wood she had carved. 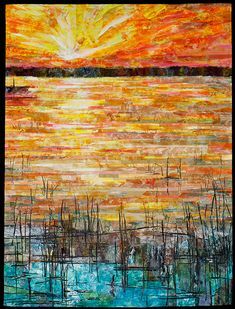 Unlike tapestry weaver David Johnson, who develops his designs with the horizontal fibers (the weft) on his loom, Alice concentrates on the colors in the warp fibers that run the length of her loom. By the time she sits down to weave the weft fibers that will hold them together, the colorful rhythm in her fabric has been set. She usually selects just two colors, often similar, to alternate as she works her way down the loom. The result is multi-colored stripes that reveal Alice’s penchant for the Southwestern palette. I found myself enchanted not only by her imaginative figures but also by the stories pinned on the walls of her booth. Although mythical in nature, they add profound meaning to her art. If you would enjoy letting your imagination fly high, treat yourself to the two brief myths on her website. Kimber Baldwin of Cincinnati, Ohio, briefly sat spinning silk and merino wool yarn outside her booth at the Estes Park Wool Market. Shortly after I left Alice’s booth, Sleeping Beauty came to mind. I ran across Kimber Baldwin alone in a quiet area with her spinning wheel. Kimber had come from Ohio to set up her Fiber Optic Yarns booth with her daughter, who was manning it for her just then. 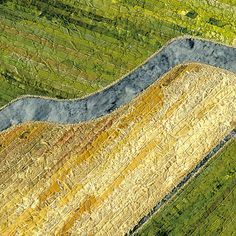 Kimber, formerly a research chemist, started playing with fiber and dyes in her basement after becoming an at-home mom. Today she buys dye in primary colors from a laboratory and mixes them to obtain the spectrum of colors for her wool and silk yarns. A sample of the beautiful colors she was selling at her booth for her business Fiber Optic Yarns currently appears in the Facebook cover photo of Handmade on the Front Range. The flyer on a spinning wheel simultaneously twists fiber into yarn and winds it onto a bobbin. 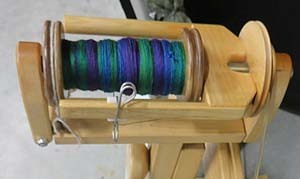 Here the bobbin contains a combination of merino wool and silk spun and dyed by Kimber Baldwin. As Kimber told me her story, her feet pumped the pedals that controlled the wheel, leaving her hands free to control multiple fibers of wool and silk that she fed from her lap to the spinning wheel. How much fiber she allowed to pass between her fingers at any one time determined the weight of the finished yarn. Above the wheel, the mechanism called a flyer spun rapidly, simultaneously twisting the fibers into yarn and winding them onto a large bobbin. Nowhere in sight was anything on which Kimber could have pricked her finger, as Sleeping Beauty had. In fact, the word spindle doesn’t necessarily appear on diagrams of modern spinning wheels. Although there was no spindle on Kimber’s wheel, there were “drop spindles” for sale in Kimber’s booth and a few booths away at Woolly Designs, the Crawford, Colorado, business of Tracy and Jean Eicheim. These handheld spindles are all that’s necessary to twist fibers into yarn or thread. Until the invention of the spinning wheel near the end of the Middle Ages, spindles were the only tool for making yarn. 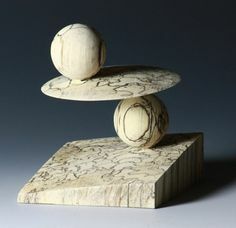 Tracy Eicheim makes wooden spindles with designs that he cuts using a scroll saw. These spindles were on display at the Woolly Designs booth at the Estes Park Wool Market. 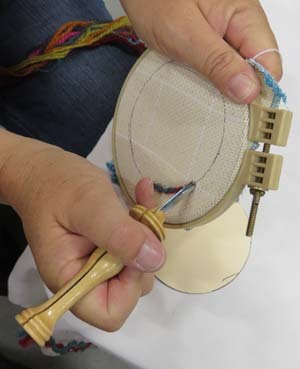 As I walked up to the Woolly Designs booth, charmed customers were standing near the display table, spinning yarn for the fun of it and captivating passersby, much to the delight of spindle maker Tracy Eicheim. Their wooden spindles rotated rapidly in midair, suspended by the fibers they were twisting into yarn. 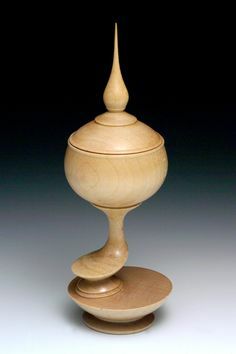 The spindles have three essential parts: a whorl (a circle three to four inches in diameter), a post a few inches long that is connected tightly to the center of the whorl on the underside, and a small metal hook sticking up from the center of the top side of the whorl. One of Tracy’s customers showed me how he secured yarn to the post. He then guided the yarn into a tiny notch at the edge of the whorl and caught it with the metal hook at the center. 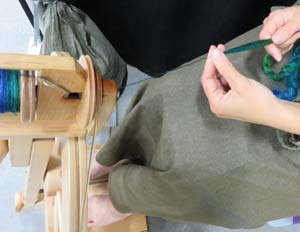 Holding wool fibers about shoulder height in one hand, he twisted the spindle’s post with the other hand and let the spindle drop with the hook above and the post below the whorl. Rotational inertia kept the whorl spinning while the fibers twisted into yarn. When the spindle slowed to a near stop, he caught the post and wound the spun yarn around it. He would repeat the process as many times as it took to spin the amount of yarn he wanted. Using the “drop spindle” is a more time-consuming way to spin, but sales have been strong for Tracy. 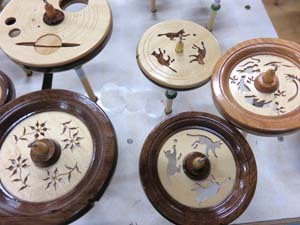 He has sold over 4,000 spindles, he told me; orders have come from every state and at least twelve countries. On July 15, Handmade on the Front Range will feature another artisan who participated in this year’s Estes Park Wool Market — Anne Phillips of Masonville, Colorado. 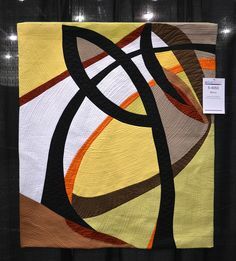 This entry was posted in Events & Classes, Fabric & Fiber and tagged rug hooking, spinning, weaving, Wool on July 1, 2015 by Sally. Carolyn and I visited the wool market a few years ago when she was here to visit and had a great time. We both enjoyed this post. Thanks . Glad you enjoyed it. I appreciated that the vendors were so willing to share on the spot.